UK customers usually receive orders within 2-3 working days via our UK distribution centre! 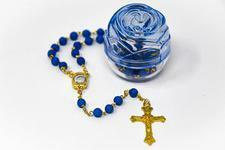 Catholic Gift Shop Ltd is based in the UK and supplies Lourdes Water, Rosary Beads, Miraculous Medals and a large selection of the best Catholic Gifts. Our fine range of quality and unique Religious Goods and Catholic Jewelry can be posted to most international locations. We pride ourselves on supplying a very reliable international postage service, which includes delivery within the UK and also to Australia, Canada, USA, South America, Asia, Europe and Africa. When shopping on our site, wherever you would like your pilgrim gifts sending to, we will send them! We are proud to offer catholic gifts, lourdes water and other pilgrim gifts depicting the apparitions, of when Our Lady of Lourdes appeared to Saint Bernadette 18 times. 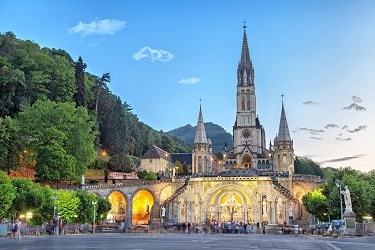 Our Lourdes Religious Store has hundreds of discount Catholic products and souvenirs from Lourdes, in France and we are continually adding more items to give our customers even greater choice of Catholic Gifts and the best shopping experience. However, if there are any other items that you are shopping for, but can not find on our Catholic website, please do not hesitate to contact us to let us know and we will happily assist you and do our best to provide the item that you would like, at the cheapest discount price possible. Our Catholic Shop accepts all major credit / debit cards and also other payment methods on request. All orders are sent out quickly and can be shipped fast to most international locations from our Catholic Shop. We have a UK distribution centre, so UK customers can usually receive their orders within 2-3 working days.